Hyacinth belongs to the family of Liliáceae. It comes from Asia Minor, the Mediterranean. These flowers grow from perennial bulbs. Flowers have campanulate form with the curved blades, the leaves have a lilia-like form at one plant happens to keen edges to 8 pieces. 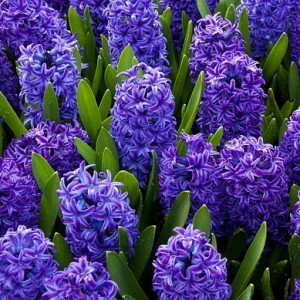 The hyacinth east is most widespread, this culture became very popular in Europe since XV century. Since then more than three hundred various high-quality grades were removed. It is possible to judge high quality of a hyacinth on leaves which indirectly rise to top, evenly going extensively, the trunk has to be direct and be distinguished from leaves. The inflorescence has to have an equal conic or cylindrical form, the bigger quantity of flowers in it - the better. Flowers shouldn't overhang.